It is common knowledge that certain profiles of hitters are more reliant on home runs than others. For example, and generally speaking, a low average/power hitter’s home runs would make up more of said players RBIs than a slap or line drive hitter. This percentage can be seen as one’s ‘HR/RBI Percentage,’ or what percentage of runs batted in your home run total accounts for (only your scored run, not those on base). Below is the distributed HR/RBI% of “players with power” (15+ homers) across Major League Baseball in 2017. 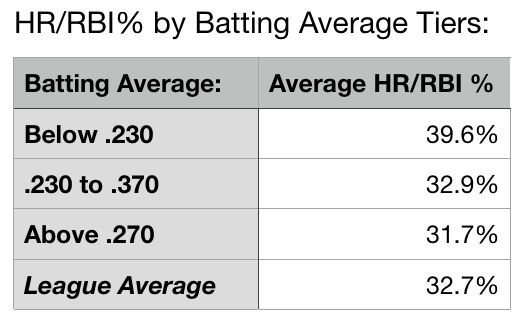 What can be noted is that, while the league average HR/RBI% sits at 32.7%, the distribution of HR/RBI% is extremely variant based on batting average. 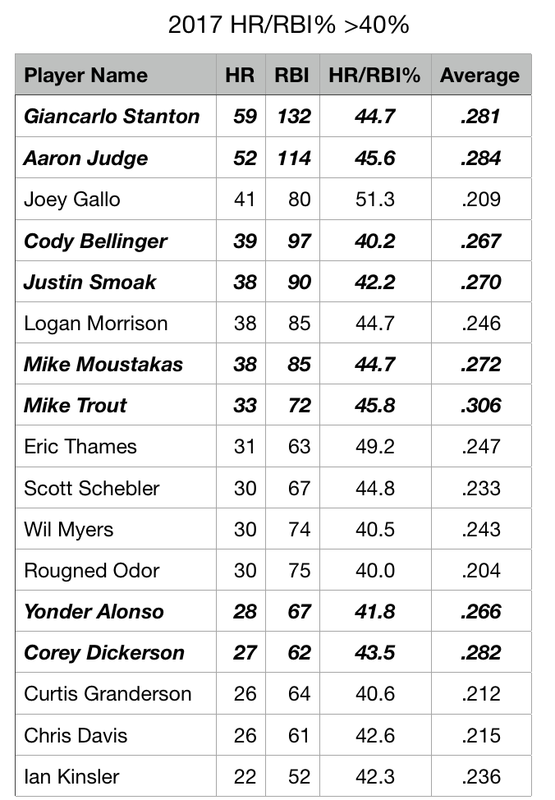 While most players’ HR/RBI% follows the league-wide batting average trends, there are a few radical anomalies. in 2017, there were 16 players whose home runs made up more than 40% of their total RBIs. But the most interesting selection of this group is the “anomalies within the anomalies;” the players who inexplicably had an HR/RBI rate above 40 while also maintaining batting averages above .260. Given their historic and outrageous home run totals that account for so many of their hits, Judge and Stanton can be given a pass. But after them, there are a few interesting players with HR/RBI rates 10% higher than their expected production, and ways that fantasy baseball managers can use this knowledge to their advantage. Trout was disadvantaged by hitting second in an Angels lineup that rotated between numerous subpar leadoff hitters, including Brandon Phillips, Yunel Escobar, and Cameron Maybin, all of whom sported sub .335 OBPs. The negative effect these poor players had on Trout’s RBI totals can be seen by his league-high HR/RBI%. Hitting the best player in baseball behind less than average players is a recipe for Mike Trout to hit a meager 72 RBI (accounting his injury, still a sub 100 RBI pace). Trout, however, may not be banished to subpar RBI totals and freakishly high HR/RBI% in 2018. When Kole Calhoun and his .348 OBP hit in front of him in 2016, Trout’s HR/RBI% sat at a far more reasonable 29%. Given the Angels offseason acquisition of presumptive leadoff man Zack Cozart, who posted an astounding .385 OBP in 2017, there is hope for Trout’s counting stats. As if you needed any more reason to draft Trout. However, this ‘upward regression’ of Trout’s HR/RBI% is reliant on Cozart sustaining his career high OBP, to an extent. After moving from a stagnant Athletics lineup to hitting behind Jean Segura’s .350 OBP in Seattle at the deadline in 2017, TDG Podcast Patronus Yonder Alonso saw his HR/RBI% drop from an outrageous 44.8 to a more anticipated 33.3. Though sample size should be noted, this move out of Oakland to a much higher run producing offense helped Alonso’s HR/RBI%, and thus his counting stats, immensely. Fortunately for fantasy owners, and for Alonso, he managed to find an even more enticing home in free agency this winter in Cleveland. 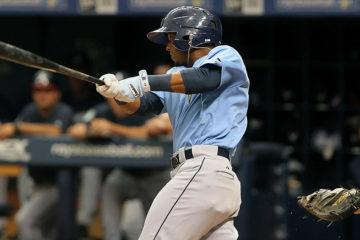 If Alonso enjoyed hitting after Segura in Seattle, hitting fourth behind Jose Ramirez and his .374 OBP (2017) should see the first basemen flourish. Alonso is a fantasy asset that often flies under the radar in a deep 1B crop, but his position in the Indians lineup could be all the justification needed to add him to your roster as a cheap source of power and counting stats. While Alonso and Trout’s expected HR/RBI% normalization will be assisted by new batting order neighbours, Justin Smoak of the Blue Jays will rely on the improvement of one of the worst offenses in baseball. 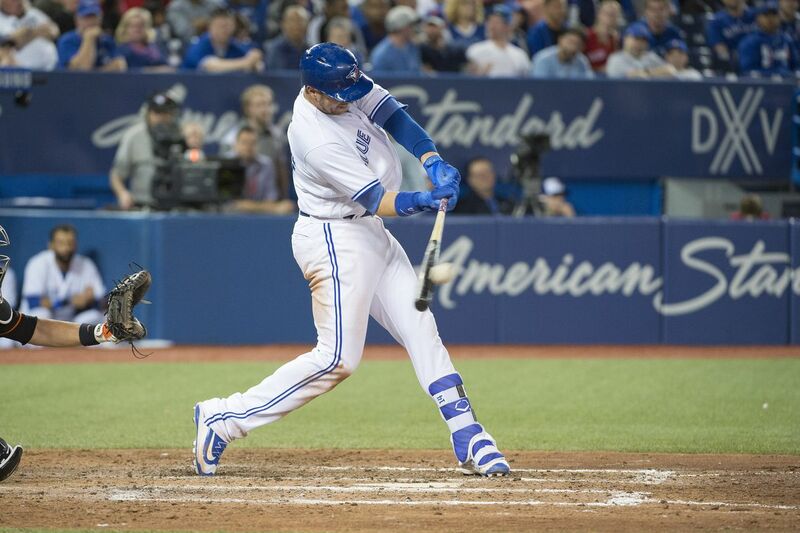 After reaching back-to-back ACLS in 2015 and 2016, the Toronto Blue Jays posted the second-fewest RBIs in the American League last year, even while rostering Josh Donaldson and getting a breakout season from Justin Smoak (among several other weapons). Down years from Kendrys Morales, Jose Bautista (now replaced by Randall Grichuck) and many other Jays, plus injuries to Donaldson, Troy Tulowitzki, Russell Martin and Devon Travis saw the Jays’ run-scoring largely reliant on Smoak. While the Jays offense will likely sit around league average, that may be all Smoak will need to see positive regression in his HR/RBI%. While many point to the Jays first baseman as a possible bust candidate, improved seasons from teammates plus full-strength Donaldson and Travis could help counter any normalization from the 2017 breakout. Pujols cannot be found on the list of HR/RBI% anomalies, as he is a player of note for all the wrong reasons. While the aforementioned Trout was starved of RBI opportunities by a weak 2017 Angels leadoff rotation, the man batting after him had quite opposite results. Albert Pujols hit a mere .241 in 2017, but hitting behind the Melville Meteor’s .442 OBP allowed the veteran slugger to rack up 101 RBI (to the tune of a mere 22.7% HR/RBI%). Pujols is still a viable fantasy option in deeper formats, but with Justin Upton slated to bat fourth in the 2018 Angels lineup, a potential slide down the batting order, and subsequent drastic slide in Pujol’s RBI totals, could be on the horizon. Toronto/Montreal based. Baseball analytics, fantasy and commentary writer. 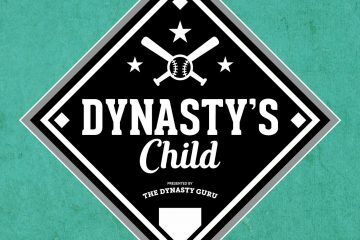 The Dynasty Guru's Triple Play: Milwaukee Brewers!